JJ: What are some of the other distinctions between the light and the dark? Audience: The dark brothers are totally selfish and self-serving and the Brotherhood of Light is the exact opposite. JJ: Light is selfless and dark selfish. Now, on the other hand, does the person who is selfish ever admit he is selfish? No it is like a maze trying to figure out who is who because they both say a lot of the same things. Not only will the dark brother talk about how selfless and virtuous and how much he has given to charity and how of this and that, that he has done but his acolytes will also praise him and say, oh Mr. Smith, he has done so much for the service of humanity. Maybe the guy is just totally selfish and what he has done with his selfishness is he has not given of himself but he has manipulated events and used other people’s money to buy the appearance of virtue. He will take other people’s money and build something with it and put his name on it and everyone will think that this guy gave us this bridge and he is a wonderful person. There are politicians in Washington with dozens and dozens of buildings, monuments and bridges that are named after them and all they did was take other people’s money and buy it for us and it did not cost them one penny out their own pocket. As they take other people’s money to build the building to put their name on it they are increasing our taxes. If you want to look for the selfish politicians then I would look for the ones with the most buildings with their names on them. The unselfish politicians will not care if a building has their name on it for what they care about is to get something done that will benefit this country and the people. You will find that this politician does not give a rat’s behind about whether or not a building has his name on it or not. I have found that the best politicians rarely have a building named after them until after they die and then somebody else does it for him. Selfishness, the difficult part of all of these is the dark brother present himself as light like it says in the Bible – Satan himself presents himself as an angel of light. The selfish brother presents himself as altruistic and virtuous because he has managed to give his constituents all this stuff. I am a wonderful person because I give you this stuff, but he did not give it to us, he gave it to us with other people’s money. When somebody says he will give you free stuff, I say that when they reach in their own pocket and pay for it with their own money then I think that is unselfish. If he did it with his own money, his own power and his own work and did it to benefit other people not using other people’s money then that is what I call unselfishness. So when a politician gets in an area of great influence and is able to buy stuff and put his name on buildings, bridges, libraries and such and get a lot of credit for being virtuous on other people’s hard work, I do not call this unselfish. I call it selfish because he is selfishly using other people’s money to build up his own ego. Okay what other differences do we have? Audience: I think the dark side is humorless and the light is joyful with humor. JJ: Light side is joyful and has humor and dark is opposite. DK Himself points this out that the brotherhood of light has a good sense of humor and when you first begin to read his book you wonder if He has any sense of humor himself but once you get into it and study Him then you see some subtle little things he says which kind of make you chuckle every once in a while. Take a look at Hitler, for instance. Whenever you see him talking he was so dead serious when he got up to speak with his body language and his voice, I can’t understand what he is saying and I would like to hear a clip where it is translated to see what he is actually saying. Every speech I have seen of Hitler, he sounds like he is mad at his dog or something. He sounds completely humorless and one of the things the allies did in World War II was they made fun of Hitler. They made jokes about him and made these films where they contorted Hitler and made him look like he was doing all this funny weird stuff and they would show the films in the theaters just to make fun of him and the whole audience would laugh and a lot people thought Hitler actually did this stuff. Hitler was manipulated in films to all kinds of crazy stuff like falling off of chairs and stuff like that. I am sure if Hitler ever knew about it that it probably really drove him crazy. It would be interesting for somebody to compile those old films, I have read about them but I have never actually seen them. What is interesting between light and dark is that light has more than one meaning. In light we think of a light like this one right here but there is also light as in opposite of heavy. The dark brothers are heavy with their feelings and their thoughts are just sooo serious. The Brotherhood of Light is light in their thoughts and they are more carefree. Annie was something about how they go slow quickly. How was that worded Annie? JJ: They hurry slowly. In other words, the impression I got was that they have a deadline but they do not pursue the deadline with a state of hurriedness; they do it in a state of relaxation. Now often times when people have deadline it just drives them crazy and they get really nervous and uptight about it but the Brotherhood of light says, just relax, everything will be fine, concentrate and if you give yourself the right amount of time then you can pace yourself and be relaxed, move forward step by step and you can have your mission accomplished. Now the dark brothers are entirely different, it has to be done at a certain time or you die. JJ: The mob is an extension of the dark brothers and you see these movies about them and what happens if the guy in the mob does not perform on time? JJ: Yes, he gets hit over the head with a baseball bat or choked or shot or stabbed or tortured or fire placed under him or something crazy happens to the poor guy who does not perform or who does not get the good guy or whatever. So it is interesting how light applies in more ways than just brightness. After Curtis and I were excommunicated we spent a number of times trying to enlighten the Mormons which is the hardest thing I have ever attempted in my life. We would go around and visit certain ones and the ones that bothered us the most we called them the squeaky clean ones. In other words, it looked like they had just got out of the shower and completely groomed no matter what time of day it was. The squeaky clean ones were always very serious and when we met with them and we presented what we thought were some of the problems in the church, they would talk to us like this, very slowly and in a deep voice, “Oh brother you know you are on dangerous ground here and you know that Satan has got a hold of you and that you can suffer very dark consequences if you continue upon this path.” They talk slowly deliberately and they are always squeaky clean. These types of guys really talk this way and they are washed, clean, groomed and I swear they have shaved within the past hour, all of them! JJ: I always seem to have some stubble going on and I cannot get shaved like these squeaky clean ones. I found that interesting that I always found them to be in the squeaky clean category, now look at Dan over here, he would never fit in the squeaky clean category! JJ: You look at him and he is mellow. He has an old T-shirt on and he is never really clean shaven entirely, and these are the type of guys that I find that I really trust a lot more than the ones who have that air of authority about them like, “I am in charge and I have authority here.” This type of guy is always rubbing me the wrong way. Audience: I had a missionary come over to my house once and I could not get rid of him and I said you can excommunicate me please, please and then finally I said you ought to get laid and that did it he left after that. JJ: If you want to get rid of them even faster give them my little booklet called Mormonism and Reincarnation. They will hold that in their hand like it is going to start on fire and they will get out of there really fast. Just say that you want to talk about it, for it has some scriptures proving that Joseph Smith believed in reincarnation. It works with the Jehovah witnesses too. I use the Bible and Reincarnation with them. They come in and I say yes I have a little thing here that proves reincarnation in the Bible and I will take your literature and you take mine and they have the same reaction. It is like it is hot to their touch. It is funny during that time period that Curtis and I tried to enlighten the Mormons, we would give them some of our material and then come back and ask them if they read it. They would always give us the same answer and can you guess what that answer is? JJ: What did they do with it, Curtis? JJ: Burned it. Nine times out of ten they would say that they burned it. And we would ask them, why did you burn it? They would say well somebody else could have got it out of the garbage and I did not want anybody to ever see that so we burned it. Even some of my family members told me that they burned some of my stuff. No they just did not throw it away they had to actually create a fire burn it to make sure no one would ever read it. It is amazing how many people told us that and it about blew us away and we would have never predicted that is what they would have done. But after it happened again and again we began not to be surprised when they told us that they burned our words and works. Audience: There is a spiritual open house in New York City and I got off the subway and here was some kind of weird Christian fundamentalist group and he talked about energy pulses confirming something about the Virgin Mary and said well that is interesting, here is a spiritual event that is coming up and within two seconds after I handed him the pamphlet he was crumbling it up and throwing it away. JJ: I can imagine, at a family reunion a while back I gave a copy of the Immortal to Curtis’s brother who was still in the Mormon Church and he did not want to refuse it because he did not want to hurt my feelings but he just could not hold it steady in his hand. It was like it was warm or hot in his hand or something. Strange. Those words reverberated in the south and right after he was elected the south determined that they had to fight this guy. This is what happens with words of light when they are sent to where darkness is. They will be fought, they will be fought just like I talked about in discussing the words and works of the two witnesses. The beast fights against them and attempts to destroy them until their dead bodies are lying in the streets of the symbolic New Jerusalem and then people are sending gifts to one another because they are so happy that they can just have their little mediocre beliefs to celebrate. “There are two things which every disciple must some day learn, my brother. One is to cultivate the ability to “sit light in the saddle” (to use an old proverbial injunction) and the other is to develop a sense of humour, a real (not forced) capacity to laugh at oneself and with the world. This is one of the compensations which comes to those who can succeed in working in the light upon the mental plane. When you can do this, the constant tension under which you labour will adjust itself. Indeed. One of the hallmarks of the worker in the light is the ability to see humor, even in difficult situations. Many of those who have not yet transitioned into light and love take themselves and life much too seriously. Humor is a somewhat illusive quality that is difficult to define, similar to that of love. You can read every dictionary definition and still not be able to put a finger on exactly what it is. For instance, a common definition is, “Something that is funny or makes you laugh.” Overlooked is the real question which is: exactly what is it that makes something funny? A short black and white answer will not do here as a thing that is funny in one situation may not be funny at all in another. For instance, a guy may offer some good-natured ribbing of a teammate in a locker room that draws a big laugh, but if the same thing were said at a Jane Austin book club meeting there may be outrage instead. Humor, or that which is funny, is created when the dialog takes an unexpected, but pleasant twist. There is an element of mild surprise and often subtle truth in those statements that make us smile or laugh. Let us examine a couple jokes from one of my favorite comedians, Steven Wright. This is a play on the speed of light which was discovered after a very serious scientific investigation. It is unexpected that anyone would even consider that darkness has a speed and the fact that it makes light of a serious subject adds to the humor. It is unexpected that anyone would think of being lazy as rewarding, but when you think about it there is some immediate reward to it. The unexpected but pleasant twist to thinking makes it funny. Don’t tell this joke to your boss while you are working on a deadline as he may not think it is funny. Let me tell you of a time that an unexpected statement really made me laugh. At one time I was thinking of going into the insurance business and I attended a presentation given by the owner of the company. Now I expected this guy to be very serious because selling insurance was a very serious business and as he began his presentation everything was proceeding about the way I expected until the guy just stopped and brushed his hand against his nose and made this statement, “Hmmm,” he said, “I think I have a booger in my nose.” That not only made me laugh but the whole room just exploded in laughter. That was the last thing that I ever expected to come out of his mouth at that time. Overall then here are some, but probably not all, of the ingredients of good humor. A subtle truth isn’t always necessary, but helps. It should be a pleasant thing to hear for the receiver. It should not insult the receiver’s belief system. For instance, a joke making fun of God may be funny to an atheist group, but not to a church group. Timing. This is very important and perhaps the most difficult to learn. Sometimes a statement said at just the right time may be hilarious, but fall completely flat when the timing is off. There are many benefits of laughter, not the least of which is one’s health. 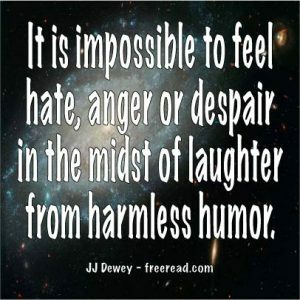 I first became aware of the healing qualities of humor many years ago when I read about the experience of the famous writer and editor, Norman Cousins. In 1964 he was diagnosed with a terminal and painful disease called, ankylosing spondylitis. The doctors told him that he only had a few months to live. After concluding that the orthodox treatments he was given was accomplishing nothing he decided to treat himself. He felt his disease was triggered by stress and the best anti stress medicine is laughter. He checked himself out of the hospital and sealed himself in his room and read every comedic writing and watched every funny movie he could get his hands on. When something tickled his funnybone he went with the laughter as much as possible. Within a month he had greatly improved and his doctors were amazed and couldn’t believe that laughter had anything to do with it. Within six months he was completely cured and went back to work full time. It triggers the release of endorphins causing a natural high relieving distress and pain. It increases blood flow making for a healthier heart and circulation. Laughter helps you live longer according to a study in Norway. It is particularly helpful for cancer victims. In addition to health benefits there are many spiritual ones. Those without much humor in their lives tend to focus on the negative and keep their attention there so much that their mood is soured and negativity seems to fill their lives. They tend to be quite pessimistic. Laughter shifts ones attention away from the negative and causes the consciousness to put things in perspective. Yeah, maybe you’ve had a bad day, but after a good laugh you see that, all things considered, it wasn’t so bad after all. If he ventures into teaching a little humor goes a long way into making the presentation more interesting. Overall, there is no downside to humor in right proportions. May we all add some of its spice to our lives.